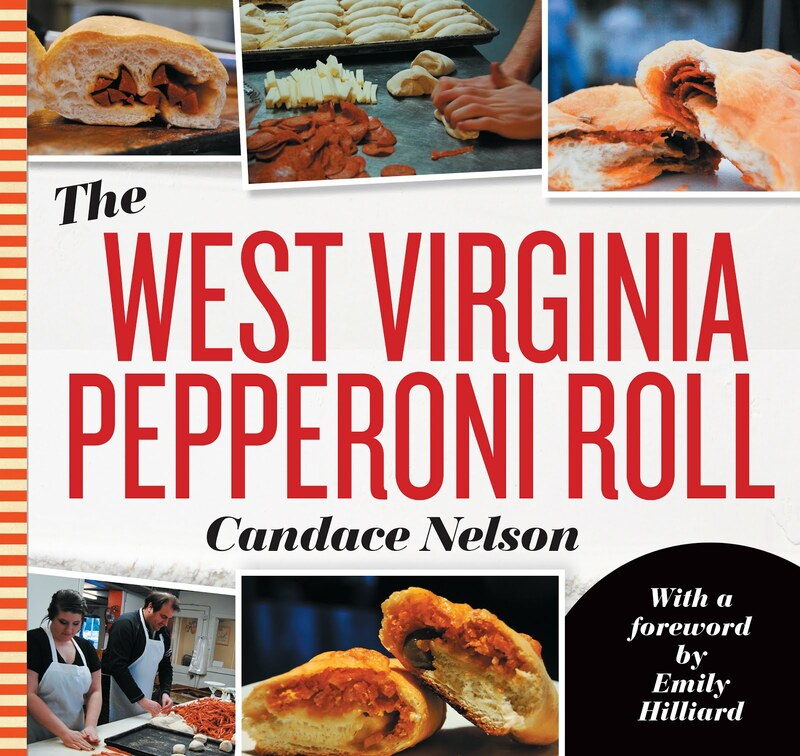 Kentucky has a lot of French influences, which is seen throughout city names, the statues and even the restaurants. 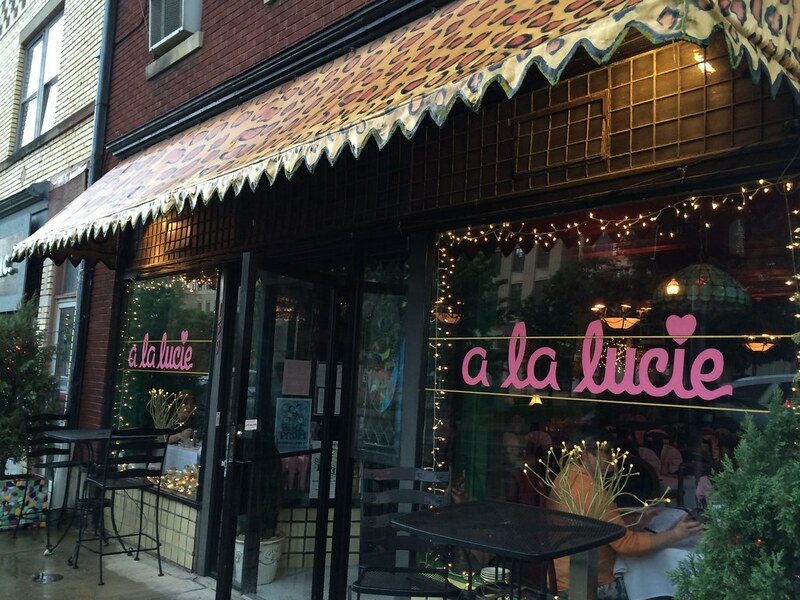 A La Lucie is easy to spot with its leopard print awning and twinkling lights around the windows. 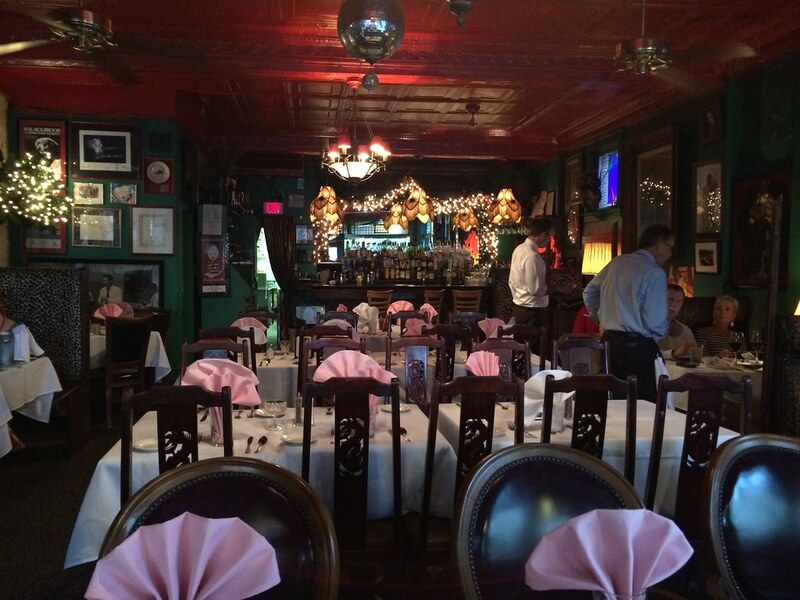 The interior delivers with light pink napkins, leopard print booths, red tin ceiling and French-inspired paintings. Think Moulin Rouge. We had made reservations and were seated in a booth on the right side of the restaurant. There was a little confusion with the first server who seated us and then the other who took our drink orders. It seemed like they were rushing and a bit disorganized - that's when we learned the waiter who was supposed to be working that night had an allergic reaction and had to go to the hospital (there was sesame in a dish he didn't realize). So the actual chef was helping fill his place. And Lucie herself was in the back cooking. As we look over our menus, Vicki realizes she hasn't brought her reading glasses. 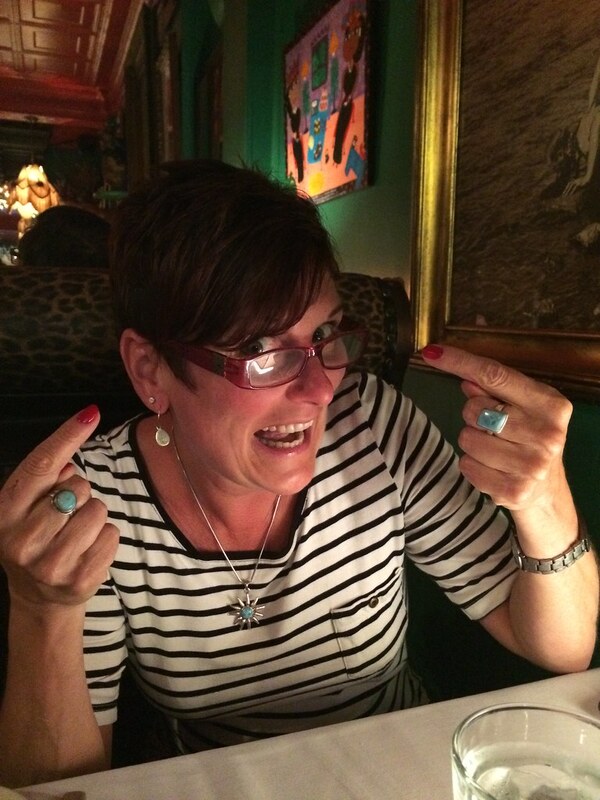 Long story short, Vicki ends up with Lucie's reading glasses to read the menu. I ordered the seafood casserole, a house favorite. 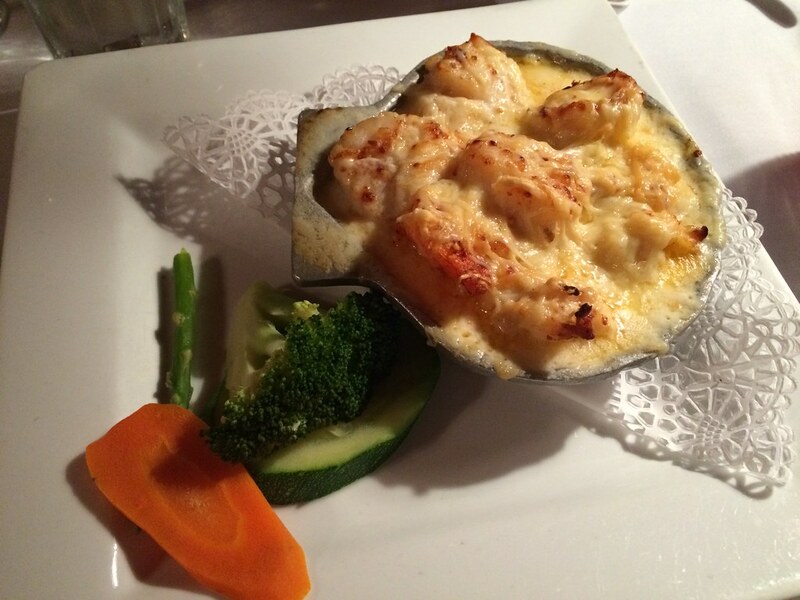 It has lobster, scallops and shrimp baked in a mornay sauce over rice. Mmm. 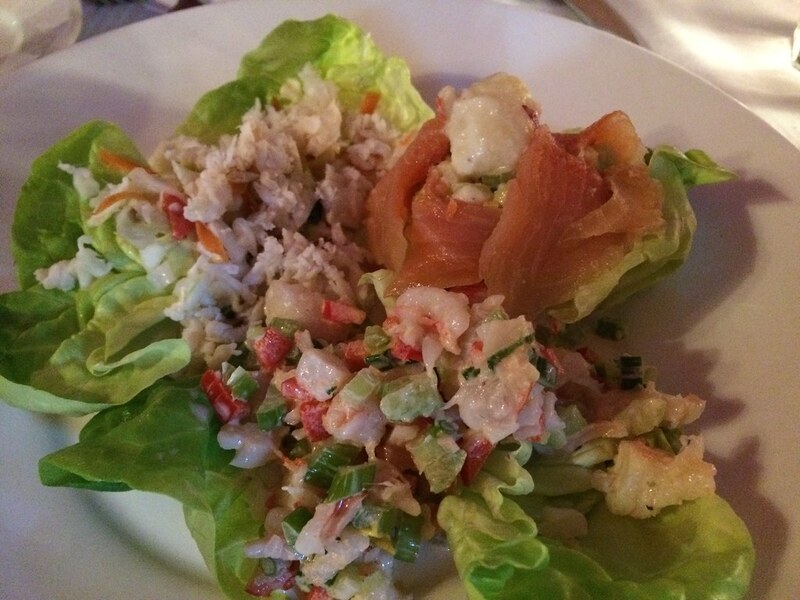 But before that - Vicki had ordered their featured appetizer of the day which had mini crab, shrimp and salmon salads. Very fresh and crisp. We were also brought out a basket of bread and butter. Neither was particularly warm, but it was still salty, garlicky, delicious. And THEN I also had a salad. So, we're like three courses deep at this point, right? 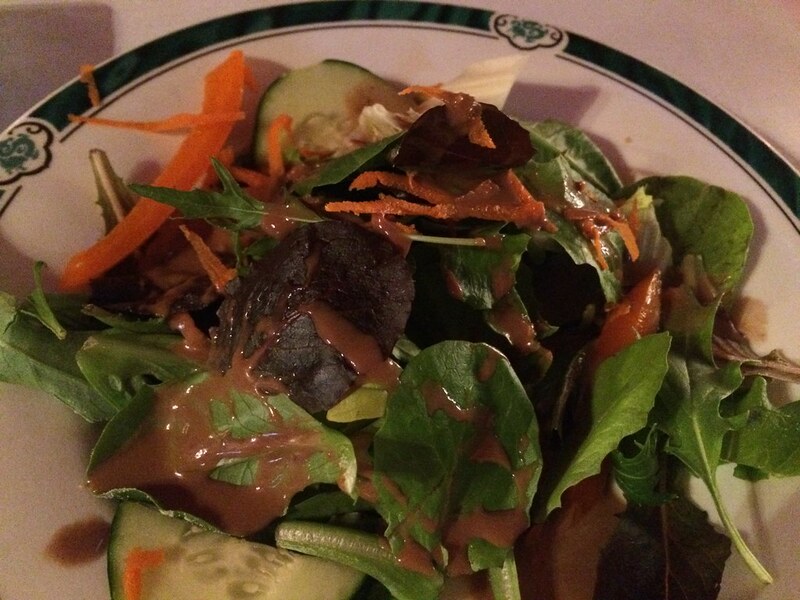 The salad was not bad. Nothing memorable, though. 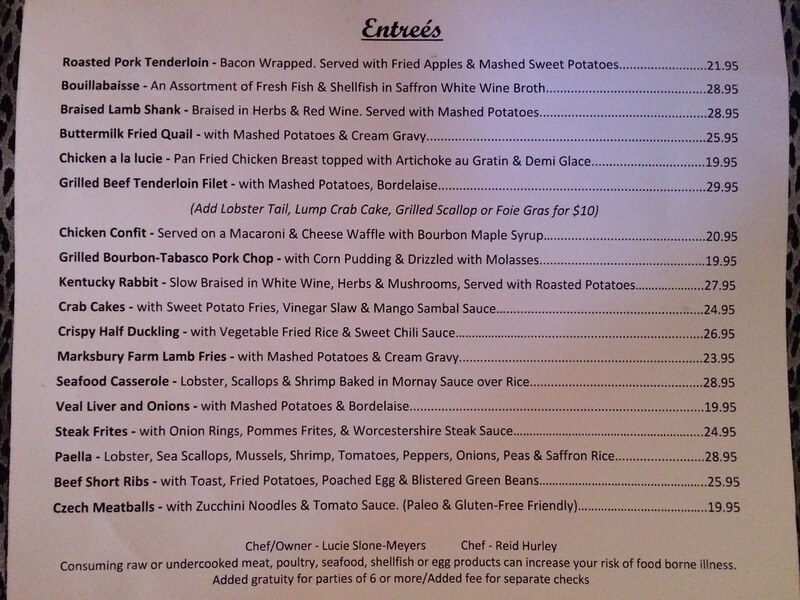 Our entrees came out not long afterward. Vicki had ordered the buttermilk fried quail, which was mind-blowing. 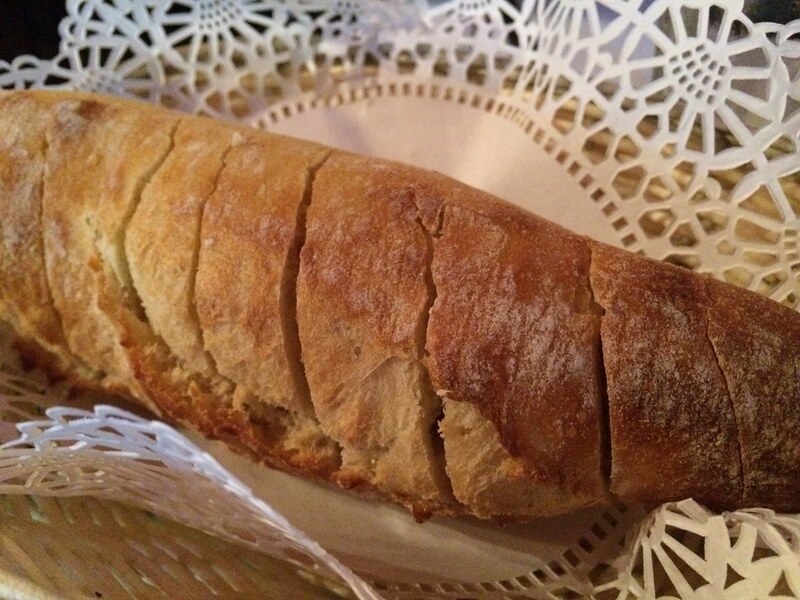 The meat was perfect and tender, the batter was crisp, salty and flavorful. The mashed potatoes and cream gravy perfectly complemented the crisp quail. Delicious. My dish was amazing. Cheesy and creamy and everything my diet had been missing. It's rich and delicious. Dessert looked too good to pass up. 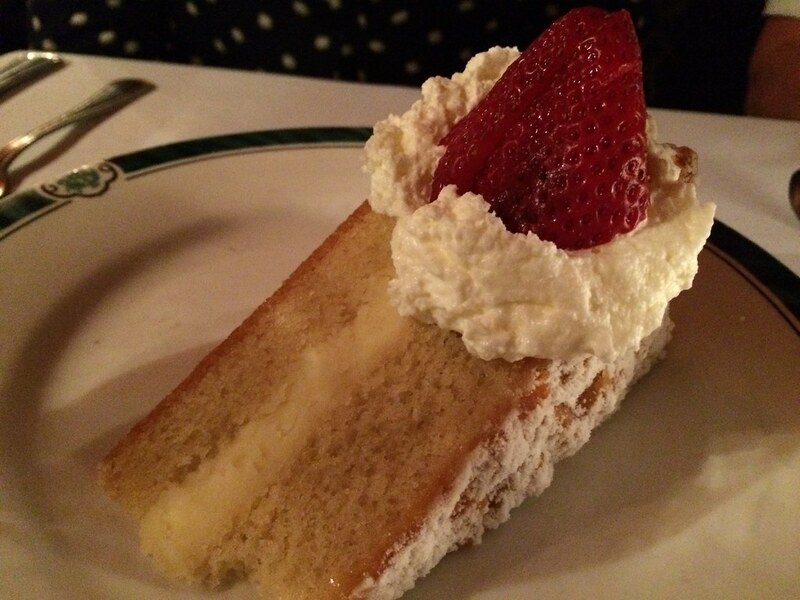 A lemon cake, a creme brulee and a bread pudding. We lined all three up along the center of the table and just took turns taking bites of each. The lemon cake was the most refreshing after such a heavy meal. 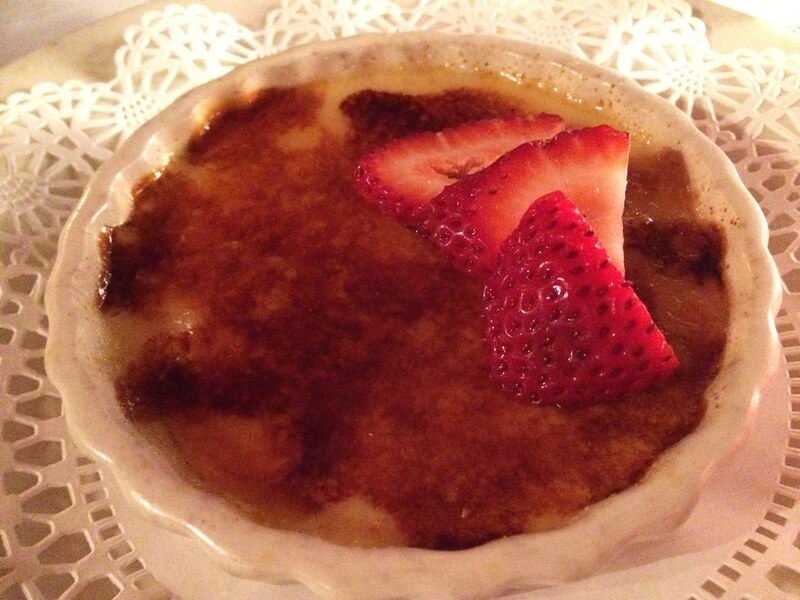 The creme brulee was delicious, but I've had many in my lifetime, so I was hoping for something slightly different. 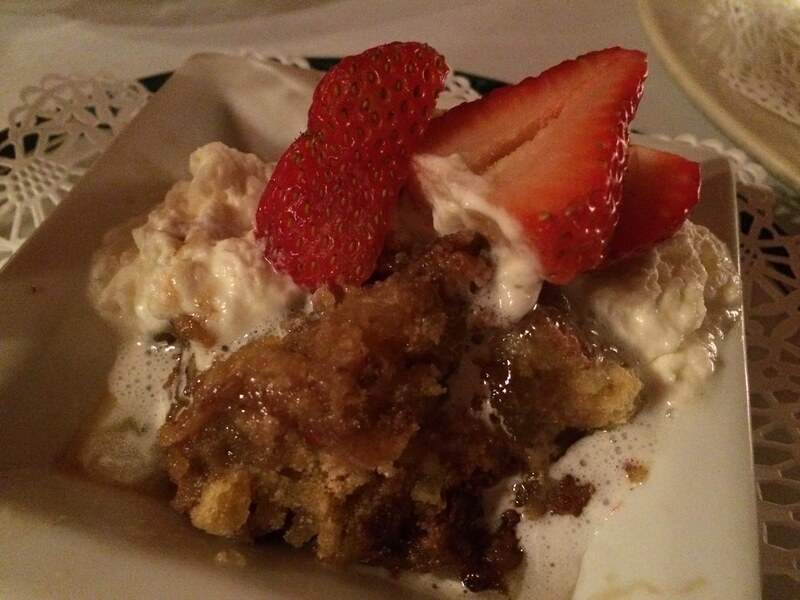 The bread pudding was good, but not my favorite of the bunch. I think the cake was the best. But I am very, very picky with my bread pudding. This was good. Overall, we had a great time at dinner, and our meal was really great. The service was lovely, and everyone was so kind. A great experience all in all.